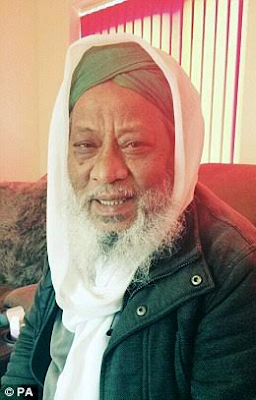 Jalal Uddin, a 71 year old Muslim leader in Rochdale park was brutally murdered by two ISIS fanatics, Mohammed Hussain Syeedy, 22, and Mohammed Abdul Kadir, 24 after they believed he was into a form of faith healing they saw as 'blackmagic', Manchester crown court heard today. Mr Uddin died after losing consciousness as he was found with severe fractures to his skull administered with a hammer as he walked past a children's play area near Rochdale town centre. He died without ever being able to say who killed him or why or why he was targeted. Syeedy in court today denied the murder charges while the other crime suspect Kadir has reportedly fled. He told the court that Mr Uddin was a practitioner of a form of Islamic healing called Ruqya which involved the use of Taweez. Syeedy and Kadir, both alleged ISIS supporters discovered that Mr Uddin was a practitioner in the summer of 2015 and began to stalk him, the prosecutor said. The prosecutor also said that the pair had, 'developed a hatred of him'. Mr Uddin was found seriously injured by two young girls shortly before 9pm on February 18, 2016, as they entered the park and discovered him on the ground.